Batley's Huazaifa Patel sends down a delivery against Townville last Saturday. 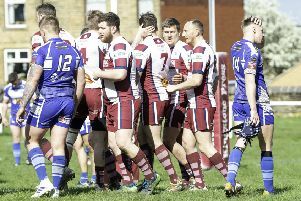 Batley suffered a second straight defeat in the All Rounder Bradford Premier League, going down by 97 runs in the battle of the two promoted clubs. Townville’s batsmen were in good form with opener Kris Ward (74), Jack Hughes (42) and Connor Harvey (41) helping them secure maximum batting bonus points with a total of 261-8. Tariq Hussain was the pick of the Batley bowlers with 5-71. Shabir Rashid (37) and Muhammad Hafeez (31) led the Batley reply but they were bowled out for 164, with spinner Hughes taking 4-21 to give his side a maximum point haul. Hanging Heaton earned a second win as they dismissed Bradford and Bingley for 116. Heaton captain Gary Fellows took advantage of a new rule of an uncontested toss and asked Bingley to bat first and conditions proved to the visitors’ liking. Pace bowlers David Stiff (4-33) and Tom Chippendale (3-17) did most of the damage, with Bingley captain Gareth Phillips the only batsman to pose problems with a battling 54. Heaton were given a scare when Yassir Abbas removed Fellows and Richard Foster in the first over and at 2-2 it looked as if a close game might be in prospect. Nick Connolly followed up his knock of 65 against Townville on the opening day with a second half century and steered the visitors to victory with 56 not out. Callum Geldart (51) also chipped in with a first half century for his new club as Heaton secured a six-wicket win. Hanging Heaton are a point behind champions Pudsey St Lawrence, who endured a couple of anxious moments before securing a 22-run win at Lightcliffe. Kasir Maroof (56) and Adam Wainwright (45) helped Lightcliffe into a strong position in reply to St Lawrence’s 234-7 but once both fell to the spin of Chris Marsden (3-53), the pressure built on the home side. Jonathan Wilson made 37 but Charlie Parker (4-32) ensured that St Lawrence wrapped up another win. Marsden earlier top scored with 66 with support from Tom Hudson (42) and captain James Smith (38).